This community service allows the user and the character (agent) to engage in a wide range of emotional and conversational communication on the PC desktop, instant messenger, website etc. Trade and train characters and purchase and wear items (capable of animations wearing items). 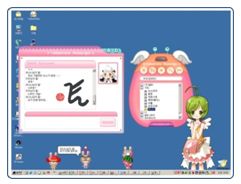 Simultaneous conversations with characters on the PC desktop, instant messenger and personal websites. System requirements ㆍRuns on Windows-based PCs.